From palatial penthouses to high-end homes, the following properties prove Florida has more to offer than retirement communities. Projects include: 3550 South Ocean, The Ritz-Carlton Residences Sunny Isles Beach, Four Seasons Private Residences Fort Lauderdale, 8050 Vero Beach, The Estates at Acqualina, The Residences at Mandarin Oriental Boca Raton, Auberge Beach Residences & Spa Fort Lauderdale, and Windsor. Award-winning real estate development firm DDG launched sales for 3550 South Ocean in January, bringing a new level of luxury to Palm Beach buyers. 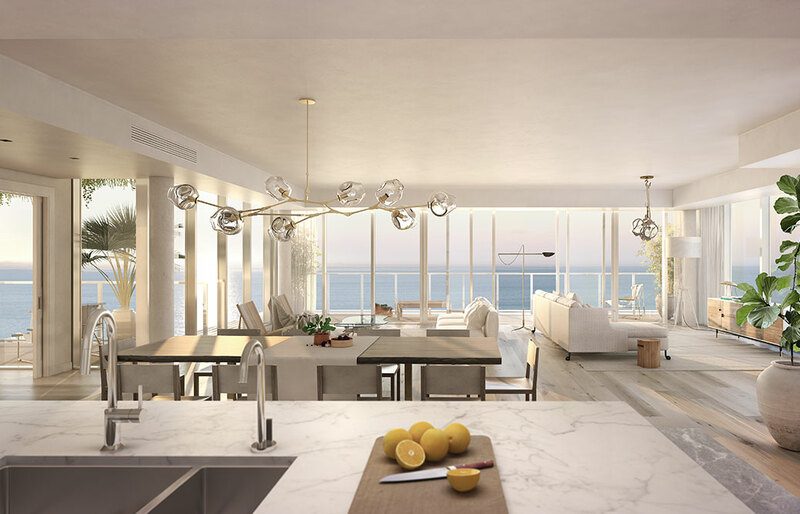 The seven-story condominium tower (the first ground-up oceanfront development to grace the Palm Beach skyline in over a decade) features 30 residences that showcase private balconies and picturesque views of the ocean. The modern, glass-walled building was designed by local architecture firms Kobi Karp Architecture and Garcia Stromberg. Inside, the two- and three-bedroom residences and penthouses (which range from 2,500 to 3,400 square feet) are decorated with limestone, white and gray travertine, coral stone, and white oak. Open-concept kitchens feature large islands and oak herringbone floors, while capacious living areas offer stunning vistas of the ocean. Covered balconies are ideal for barbecues, picnics, or wine tastings. In addition to private beach access, residents can take advantage of a beachfront swimming pool, a fitness center, a surfboard and stand-up paddleboard storage rack, and private parking. The residences, which are scheduled to be completed in 2018, are priced from $2.3 million.